The months of September and October have been almost all urban searches for me, a new SAR manager. 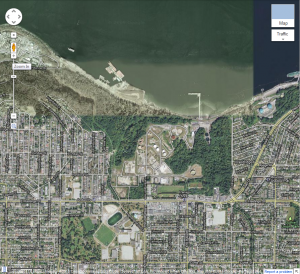 A few weeks ago we searched for a missing man in North Burnaby, a very urban environment. I’ll give the ending away; he was found alive and well. I assisted managing the search; not the first time I’ve spent time in the command truck during an urban search, but I made a few new observations. For the wilderness setting, we mostly use topographic maps. We overlay some trails on that, but the topography tells us most of what we need to know. A little land cover is necessary; you can safely assume that the bush is dense on the west coast, so a satellite view only confirms the sea of green trees. There are quite a few differences in an urban setting. Aside: In the rest of this article I converted the Google Maps to images linked to the google map URL. 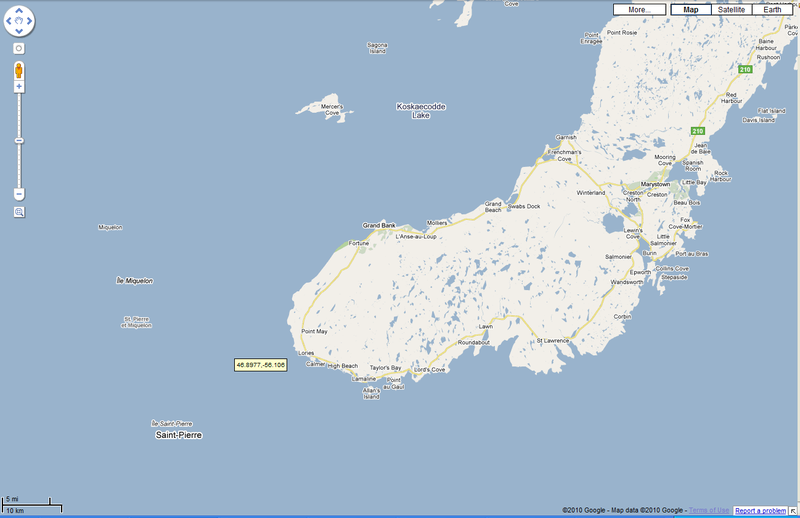 This is because in the future Google Maps will change and may have some of the missing detailed added and I don;t want this article to become completely meaningless; I just realized today that they just opened up Google Map Maker to Canada, and you can edit the map online now. You can see some green in there, but it’s really unclear what it is. 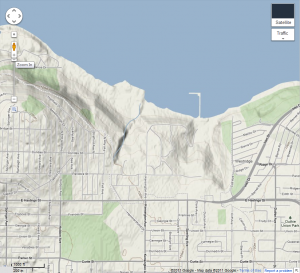 Of course, local knowledge tells us that in the middle of that area is the old shell refinery, there are some very steep cliffs on Capitol Hill north of “Highfield Drive,” and that there is a large sports complex, high school and golf course. 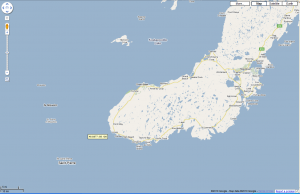 Until very recently, Google did not have the Trans Canada Trail so there would be no way of knowing that there was a trail in there, or if there are other trails. 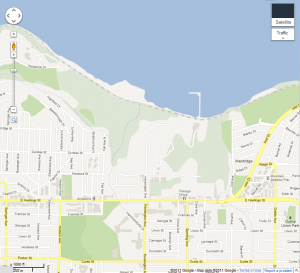 On the east side of the map is Burnaby Mountain. Now we can see some forested areas, and some of the outline of the old tanks and equipment in the Shell land. There’s also the other oil refinery at the top right of the picture. Oh, and now we can see the train tracks running along the shore of Burrard Inlet. However, this is not a map, it’s a picture! There’s almost no interpretation of what things are. We could argue for hours if a feature in this image is significant. Interesting, but not very useful. I still can’t see urban trails, park names, and the border of those industrial areas is vague – where is the fence line? Could our subject have jumped the fence, do we have to search all of the private land? There is an astonishing amount of information on this map. Go ahead and click on it, I’ll wait here until you come back. The border of the oil refinery property is clearly marked in pink (industrial land), as are the urban trails, train tracks, golf course, schools and other landmark names. 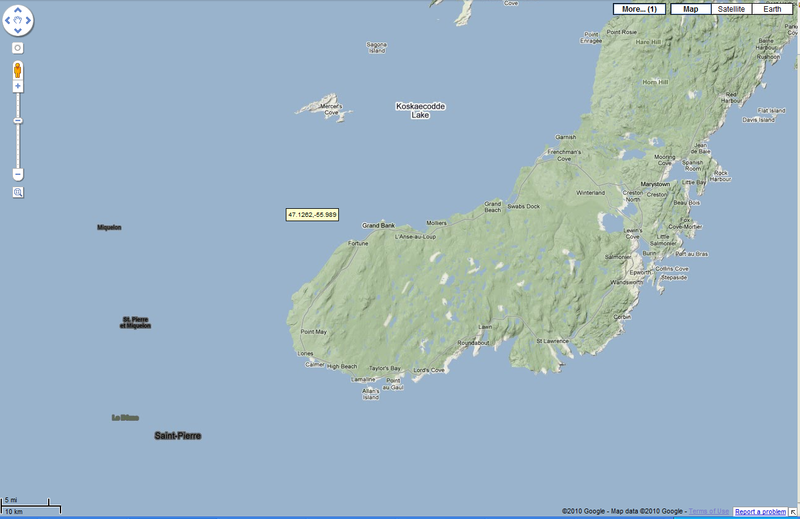 By switching OSM to “CycleMap” you can see the topography complete with elevations. Land cover is often represented – you can see how some of the refinery area is cleared, and other parts are forested. Even better, the names of the property owners are on the map — and for an urban search this means that we or the police can call the companies to search inside those fences. Now, for those that don’t know, OSM is the Wikipedia of the mapping world. Anyone can get in there and edit that map. In fact, I’ve edited it myself. 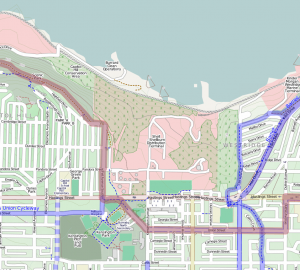 One of the reasons that some of those urban trails are on that map is that I added them. And despite the name, it’s much more than just a street map. This kind of enterprise is known as “crowdsourcing;” basically getting an undefined group of people to do what would normally be done by organized or paid workers. In the case of Wikipedia, it’s 19 million articles in ten years. In the case of OSM, by taking freely available data and millions of hours of volunteer time they’ve made very good maps of most of the world almost no time at all. So how do we trust this data? Well, the answer is that we trust it as much as we can trust Google. In 2010 ago Google did a massive update of Canada, using new data they licensed from the government. 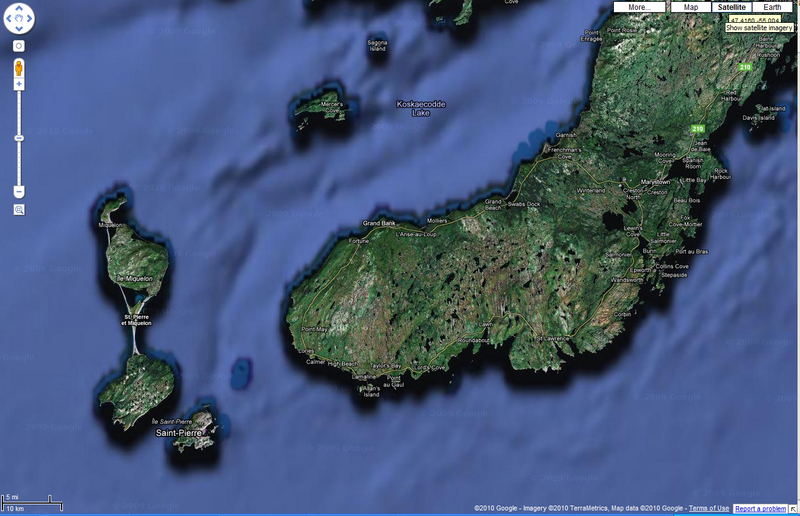 Don’t ask why, but I was interested in the islands of Saint Pierre and Miquelon. I looked, but they weren’t there. I saved the images for posterity. 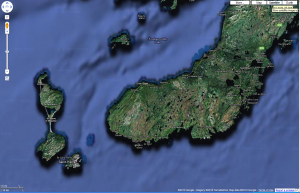 Now if Google can delete an entire archipelago, can we trust it? The fact is that any map is capable of errors. An in this case, the point is moot; Google just doesn’t have the kind of detail that OSM has, and it probably never will. OSM is “trustworthy” in that some people care enough to police and edit. “Vandalism” of the map can be reverted, and inaccurate information can be disputed. The real power is that people edit the areas they know, and they add information to make the map better. Nobody can possibly nkow an area better than someone who lives in it. They know there’s stairs that take you to a trail at the end of the street, and if they care to they can put those stairs on OSM so everyone can find them. Thus, urban trails, park names, school names, landmarks, store names, strange little streets and alleys and thousands of details that are just not available from any other source. It just so happens that when conducting an urban search, these are the kinds of details a SAR team needs. Any readers with stories about OSM and SAR? Any urban SAR specialists who want to weigh in? 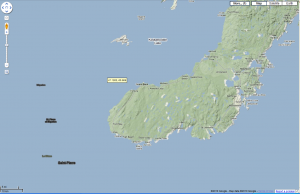 The OSM maps are great, and even better, you can download them to various PNDs too. For the Pacific Northwest, there’s another crowd-sourced mapping effort that has focused on trails: http://www.switchbacks.com/nwtrails/ This is a collaborative effort spearheaded by a Groundspeak employee (the company that manages geocaching). I’ve found that there are some trails that are only in the OSM set, and some that are only in the NW Trails set. Fortunately the two sets can be used at the same time. It seems that there are a lot of trails web sites, with varying degrees of “map” and “success” thrown in. Thanks for the tip on this one, it’s convenient that you can download just the trails for the GPS without “contaminating” it with other data. 1 Pings/Trackbacks for "SAR and Crowdsourced Maps"